Should high-tech prosthetic limbs be permissible in elite sports competitions? Why are caffeine and altitude tents usually acceptable while some cold medications are not? What will happen as we engineer new enhancing options such as genetic modification technologies that increase muscle strength, or individualized nutritional genomic programs for elite athletes? The ethics debate about the use of enhancements in elite sport is becoming increasingly complex. Yet we are not asking what relevance sports’ religious dimension has to this debate. Through an examination of literature on the relationship between sport, religion and spirituality, hope emerges as a compelling feature of sport and a significant part of what makes sport meaningful. Trothen explores four main locations of hope in sport: winning, losing, and anticipation; star athletes; perfect moments; and relational embodiment, and examines how these locations intersect with the enhancement debate. Using Christian theological reflection to problematize the four main approaches to the ethical question of enhancement use in elite sport, and the underlying values informing these approaches, Trothen asks: How will hope in sport potentially be affected by techno-science? And how might a valuing of sports’ spiritual dimension—and particularly hope—reshape the sport enhancement debate? The clear conclusion is that sports’ spiritual dimension includes hope, and the locations of hope in sport are morally relevant to the sport enhancement discussion. Technology is changing what it means to be human and this is nowhere so evident as in our sports. Trothen explains current controversies with clear and eminently readable style and gives us an eye-opening and sometimes disturbing glimpse at human-altering technologies yet to come. The questions that arise in sports competition and record keeping will never be simple again. Tracy J. Trothen’s incredible rigour as a thinker and scholar is well evidenced in these pages. Her research is comprehensive, illuminating, and compelling on many fronts. Trothen engages the spiritual and religious dynamics of sport in our secular age investigating the interconnected dimensions of ethics, morality, hope, meaning and technology. For those who have thought little about these issues, Trothen’s engaging and down-to-earth prose will draw you into the ongoing, lively, and dynamic discussion. For those who have thought much about these issues, this book is a must read. Trothen examines sport wholistically utilizing specific and recognizable examples from the world of elite sport to explore complex questions of what it means to be human and to hope in our technological age. Upon reading this book, one will never watch sports the same again! Tracy J. Trothen argues with passion and conviction that fans’ and athletes’ experiences of hope and transcendence through sports can best be understood as religious, and she makes it hard to disagree. Her theological perspectives on performance enhancement will surely change the terms of the conversation on this topic. Sports with religious fervor and religion with athletic discipline? These are ideas as old as ancient Greece or the Apostle Paul. But now comes a literal game-changer: human enhancement technology. Is it possible to think sports, religion, and enhancement all at once? That's the brilliance of this book. When we ponder our sporting, praying, and self-transcending selves all at once, we see just how super-competitive we really are. Winning the Race? is a window into our enhancement-craving, enchantment-hungry souls. A leader in addressing the religious implications of human enhancement, Tracy J. Trothen now “complicates” things for us—in a productive way—by raising important questions about “trans-athletes.” Carefully, thoroughly, and convincingly, she reframes the debate in a way that charts a path forward in understanding sport and religion, sport as religion, and the role of hope. Our core values, who we are as humans, emerging technology, what’s fair and unfair—it’s all here and woven together into a brilliant analysis that probes to the heart and soul of sport and our experience of sport. Whether you are athlete, fan, or theologian, you’ll never relate to sport—and maybe to religion—in the same way. When is an enhancement a completion of our potential, and when is it a subversion of our humanity or our sport’s true nature? What values drive the sports player’s desire to improve through surgery, medication, a strenuous training regimen, or other self-deprivation? 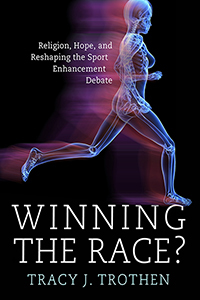 By insisting that the religious dimension of sport be introduced into the discussion of these questions, and in particular the central place of hope in such a religious dimension, Tracy J. Trothen makes a fresh and important contribution to the ethical debate on enhancement in sport. Trothen’s theological ethics illumine the debate on sport and religion in general, but also and in particular some of the most urgent issues facing today’s sports participants and administrators—this is a very welcome and timely volume. In her distinct work, Tracy J. Trothen raises ethical and theological questions about the intersections of sports with techno-science. She deftly traverses the often discrete territories of theological ethics, sports history, technological innovations, and pharmaceutical effects to study their converged impact on the meaning derived from the experience of sport. In Winning the Race? Trothen adds new dimensions of sophisticated analysis to the growing interdisciplinary field of sports and religion.